The Belkin F1DN102U, OmniView Secure 2-port KVM Switch was designed specifically for secure military and government installations. The F1DN102U lets you control multiple USB computers from a single USB console. This product ensures the integrity of your data by safely switching among classified and unclassified computers. The Switch features a dedicated processor per computer port to keep each computer separate and secure at all times, and prevent data transfer among them. 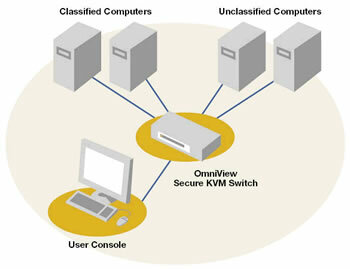 The OmniView Secure KVM Switch is listed by NIAP, and is pending NIAP Common Criteria validation to EAL 4. *Belkin All-in-One KVM cables are required to connect your computers. Question: can you switch between computers using the keyboard vice the buttons the KVM? Answer: Thank you for your inquiry. This Belkin OmniView Secure 2-Port KVM Switch only supports one method of port selection. The user can only access the desired computer by pushing the port selectors on the KVM itself. Answer: This OmniView Secure KVM Switch comes with the Belkin International, Inc., Limited 3-Year Product Warranty. Belkin does service these switches. Whether it is cost-effective to do so, however, is another matter. Question: If there is a dedicated processor per port, why does it take so long for the Keyboard and Mouse to become responsive when switching between ports? Answer: Thank you for your inquiry. The dedicated processor is strictly for security purposes. There are multiple processors to keep each target computer isolated from the others. This is one of the features to help prevent information from being passed between secure and non-secure target computers. In fact, this added security feature, along with others, may be adding to any latency. It takes approximately 1-2 seconds for the video signal to refresh after switching computers. Re-synchronization of the mouse and keyboard signals also occurs. This is normal operation and ensures that proper synchronization is established between the console and the connected computers. Note: It may take longer for your mouse and keyboard to re-synchronize when the computer is recovering (or initializing) from Standby, Hibernate, or Sleep modes. Answer: Thank you for your inquiry. This particular unit is a 2-port KVM that would require 2 ea. all-in-one KVM cables. It appears the diagram for this switch is mislabeled, as it shows the 4-port version and not the 2-port. We will update the diagram for better clarity. Question: Have the F1DN102U been tested on WIN 8 OS? Is there any issues with the WIN 8 OS? Answer: Thank you for your inquiry. We have not tested this unit with Windows 8 and Belkin has not provided any Windows 8 compatibility information. In general, it appears that Windows 8 may suffer from some of the same KVM compatibility issues that Windows 7 does. Mainly issues arise with how those newer operating systems poll for monitor EDID information and USB peripherals, and is dependent on particular user environments. As this units specs do not explicitly mention Windows 7 or Windows 8 compatibility, we would be hesitant to say whether is would be compatible, especially considering the variability of particular user environments. For further assistance, please contact your KVM Switches Online representative directly by calling 1-877-586-6654 or via our online chat feature to discuss your project in greater detail. Answer: Thank you for your inquiry. We just spoke with Belkin technical support and they stated this device should work with Windows 7. Since there is no software required to operate, this device should plug and play. However, please note, depending on if any emulation is present, it may only function with basic, wired keyboards and mice. There may also be environmental specific factors that impact compatibility. Unfortunately, detailed troubleshooting is beyond the scope of this simple FAQ. If you currently own this device, and are experiencing trouble, you can reach out to Belkin's Secure Switch Support Staff directly at 1-800-282-2355 Option-1. They will be happy to help troubleshoot any issues you are experiencing.